It only took us one game of K2 discover that it is not a race to the top. As a game, it is much more rounded and interesting than that. There is no point in getting to the top only to freeze to death before you can make it back to your tent. Which happened to more than one of our unfortunate would-be mountaineers. Now that we know better, we’re looking forward to tackling the game again, especially as it is one of those great games that offers multiple difficulty settings. It manages this in a uniquely thematic manner, as well. The board is double sided, so you can choose which ‘face’ of the mountain to tackle, and you can also choose summer or winter weather conditions, which make a huge difference to the difficulty and strategy of the game. 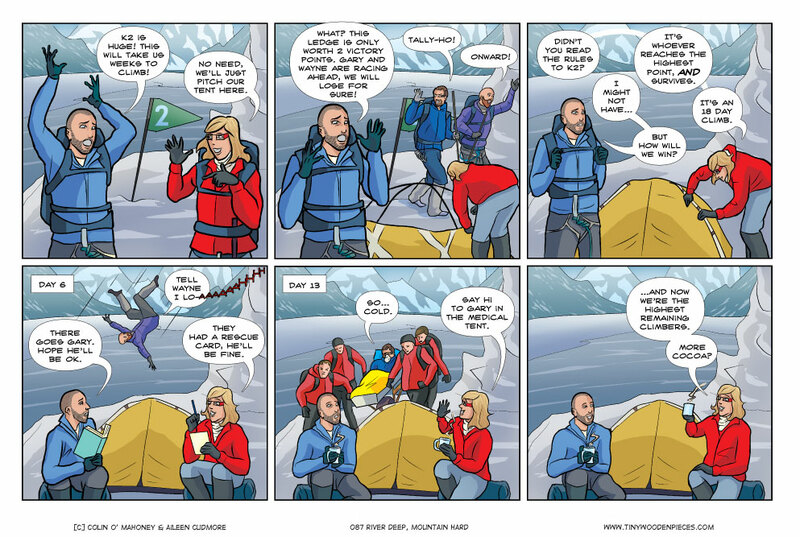 I talked about Bolt Action in last week’s comic, but I haven’t made the jump yet. I think that when I do, I’m going to monitor exactly what I spend, to track what it ultimately costs me. I’m even toying with the idea of doing a series of posts about it as I go. In the meantime, though, we have been playing the X-Wing Miniatures game. That’s a game we’ve had for a long time, and invested quite a bit in, so this year I’m determined to really sink some time into it. Plus, y’know, Star Wars fever. I cannot wait until they release Kylo Ren’s shuttle. Whatever the hell that was (Lambda Mark II?) it looked wonderfully menacing. And when it comes to X-Wing, I’m all about the Empire – or First Order now too, I guess. Though I am becoming somewhat jealous of the motley variety of ships available to the Rebel scum. X-Wings, Y-Wings, B, Ks, freighters, transports – all shapes and sizes. The Empire, on the other hand, was somewhat lacking in imagination when it came to ship design. TIE Fighter, TIE Bomber, TIE Defender, TIE Advanced – you’ll see the pattern there, I’m sure. While there’s no real local ‘scene’ for X-Wing, enough friends have now picked it up that I’m hoping for regular games. While not actually a New Year’s Resolution, more regular gaming is definitely a goal for 2016, for both myself and Aileen. Hopefully more regular gaming will allow us to really get our teeth into a few games that require that kind of time. For me, that’s X-Wing, Bolt Action, and maybe even Netrunner. Anyone else got any Gaming New Year’s Resolutions? I’m the same with X-Wing, I’ve had it for a while and now that I’ve found someone that is into it at work, I plan to have some games. I want to do a narrative based on the new movie. So a fellow FN Stormtrooper gets inspired by Finn and tries to escape the order. Have to see how it goes. As for K2 – I tried that on boardgamearena, I figured out quickly that it’s not a race to the top. Have to get some more games under my belt. We’re definitely looking forward to more K2. I’d love to do some kind of linked or narrative campaign with X-Wing, once we have some more play under our belts we might look into it. Have no resolutions. But already had a big game night at work with 8 more colleagues. So i’m already on the last year’s level. Going to a birthday today and i think we are going to play some party game, like Alias (similar to Time’s up). Definitely want to play more this year and i hope to go to Essen maybe (planned last year, but got sick). Going to Essen would be amazing! I really hope you manage it, and get more gaming in than last year.